From his perch in the Science Room, where he hangs with a steel rod up his back to support him, Dooley has been able to observe and note the characteristics of every member of the College community. his entrance by every means imaginableone year coming through the Haygood-Hopkins Gate on a motorcycle, another year landing in a helicopter on the Quadrangle, and still another time rising from his very grave on the Quad. THINK OF SOME OF THE RENDITIONS of The Star-Spangled Banner youve heard, or wedding receptions youve attended, or inaugurations of United States presidents youve witnessed, or the hundredth time youve heard Chestnuts Roasting on an Open Fire in the weeks before Christmas, and you begin to understand how some traditions can be simultaneously both endearing and excruciating. . . . Now think of Dooley. Reaching old age and finding his strength of mind declining, Dooley was seized by an old habit which I learned while campaigningdrinking alcohol. Soon liquor ruined me, and Dooley passed from this life in the home for incurables; the homes doctor saved the skeleton for instruction and eventually found Dooley this position on the faculty at Emory. From his perch in the Science Room, where he hangs with a steel rod up his back to support him, Dooley has been able to observe and note the characteristics of every member of the College community. In the 1909 letter Dooley relates in great detail his firstand so far onlyvisit to the chapel, when unidentified boys in the early hours of a dark and gloomy night carried him from the Science Room to the chapel, where they suspended him from the ceiling above the presidents chair on the rostrum. I waited patiently for the hour of prayer. It shortly began to be heralded by the boys who gathered around the outside of the chapel. . . . The boys came trooping in, smiling broadly; and then one by one the faculty wended their way towards the rostrum, smiling even more broadly than the boys. . . . [I]n a moment the tall, majestic figure of the President [James Dickey] crossed the threshold of the house of prayer. No smile lit up the grim severity of his austere countenance. Lighting into the assembled body for the frivolity at hand, President Dickey vented rage at the sacrilege of the skeletons presence in chapel. Dooley himself felt defended, at first, but then soon realized that he himself was the object of Dickeys rant. An invisible but vociferous commentator on College life in the last years of Emorys Oxford existence and the first years in Atlanta, Dooley published his observations in the Phoenix and, later, the yearbook the Campus while managing to maintain the anonymity of his amanuenses. In the ensuing decades a number of other traditions have grown up around the figure of Dooley. Contriving to appear on campus at the beginning of the week that bears his name, Dooley has made his entrance by every means imaginableone year coming through the Haygood-Hopkins Gate on a motorcycle, another year landing in a helicopter on the Quadrangle, and still another time rising from his very grave on the Quad. Custom has allowed him the privilege to arrive at a classroom and set students free. His peacekeeper is a squirt gun. Since an unpleasant incident in the impudent sixties, when a student attacked Dooley with the apparent intention of unmasking him, the visitor from Beyond is accompanied by a retinue of hand-picked students, whose black garb and shades appropriately complement the weird visitor from the grave. Taking for himself the first name and middle initial of whoever happens to be the Universitys president, Dooley rises above the mutability of University life and, indeed, of life itself. Which brings up the more excruciating aspect of Dooley. There was the moment preceding the Carter Town Hall Meeting in September 1996, when Dooley came to the Woodruff Physical Education Center to pay his respects to President Jimmy Carter and the gathered freshman class. Those who were there still recount the interminably long, painfully slow walk Dooley made from the back of the audience to the stage, and then, having had his statement read, the equally patience-wearing crawl back out the doors. How is it that such a spirit of ironyat times whimsical, at times causticwith enough of a penchant for physical courage to ride motorcycles and helicopters (what has he got to lose, after all?) can have become the decrepit and unimaginative traveler of the 1990s? 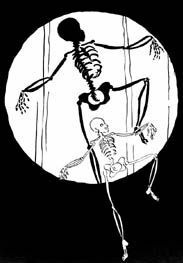 Does it have something to do with the decadethe infection of bones by a widespread American caution inspired by economic prosperity and anxiety about its end? Fear that the new millennium will bring the sound of Gideons trumpet, raising others long-dead from their graves too? Who knows? But surely one can hope that Emorys Lord of Misrule, who once had the flexibility to clamber out of a coffin and the vitality to scamper in and out of classrooms, can learn once again to move with the speed of laughter. Excerpted from A Legacy of Heart and Mind: Emory Since 1836 by Secretary of the University Gary Hauk 91PhD, published this spring.